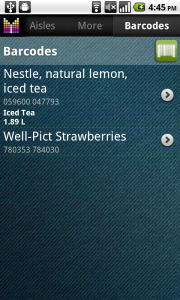 NOTE: Barcode scan feature requires Barcode Scanner application (free and open source) to be installed on your handset. If you don’t have it already, you will be advised to do so. To scan a barcode, open the Sidebar by tapping the button on the top-right and then tap the Barcode button. If you use barcode scan often, long-tapping the Barcode button will bring it to Toolbar on the top. After barcode is scanned, Mighty Grocery checks if the item has been scanned previously. If not, the app sends request to online catalog of 1.3 million products and displays the result. Either the product was found or not, you can change product details and the name you would like to see on your shopping list to your convenience. When you tap Done for the first time after successful product search, you will be suggested to Anonymously publish changes you make to product details. If you would like to scan multiple barcodes for future use, it is advised to scan barcodes in My Picks section. 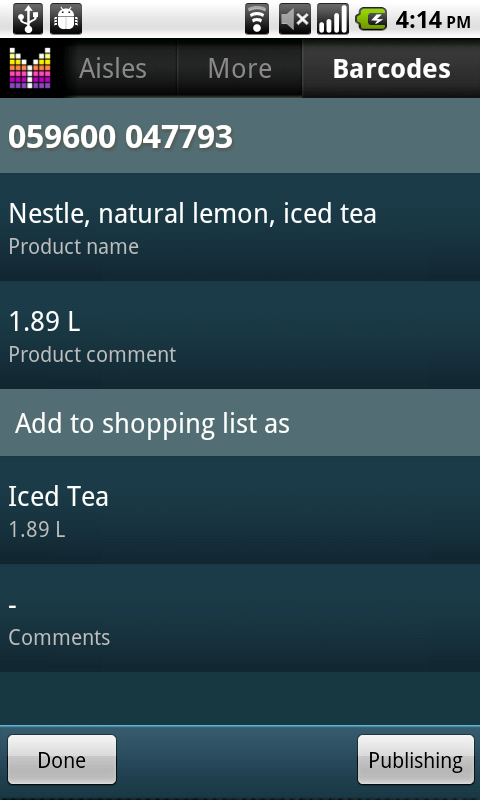 Just go to Menu –> Settings –> Pick list –> My picks and add items as you would in shopping list. To change a Barcode assigned to an item, open Edit Item Details screen and tap Barcode button to scan a new barcode you want to assign to the item. The new scanned barcode will replace the existing one. This way you can assign barcodes to items you already have on your shopping lists. Though barcode record in Mighty Grocery does not keep price information, it is possible to use price information from items in your application. To do so, the barcode needs to be assigned to item or product as explained in “Add item to shopping list by scanning a Barcode” or “Assign Barcode to existing item” above. 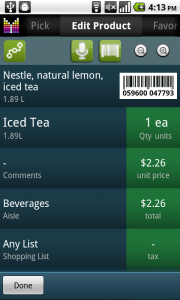 Once you have the barcode assigned to an item, the app will reuse saved price information. Therefore the next time you scan this barcode in shopping list, a new item will be added with the price information from the product which barcode was assigned to. To change product name you see on Barcode Bar, tapping the Barcode Bar will open Barcode Edit screen which allows changing product details you would see on Barcode Bar. To clean item from assigned barcode, open Edit Item Details screen and long-tap the Barcode bar. Mighty Grocery keeps all scanned barcodes locally for your convenience. To review all barcodes scanned so far, open More –> Barcode Scans. You may also want to suggest better product name or add new products by publishing changes you make to product details. All changes are submitted Anonymously and becomes available to other users after review. IMPORTANT: No changes will be published until you explicitly agree to publish changes you make to product details. Q: Why Barcode Scan won’t find anything for me??? Well, most likely it’s because people in your area decided not to publish product details for use by others. Since barcode database is maintained voluntarily, the more people contribute the more chances you get to find what you are looking for. With the new convenient way to share product details in Mighty Grocery it might be a good time to start contributing. The barcode scanner isn’t working with my phone. Motorola MB 502? Is there any other that I can use? Hi Alessandro, thanks for your question. 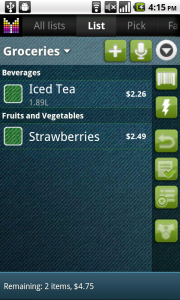 Unfortunately, Barcode Scanner is the only barcode scanner app compatible with Mighty Grocery. Could you please suggest what is the exact problem with Barcode Scanner? Thanks. I already have AT&T code scanner that workshop very well. Is’nt there a way to assign this scanner to your shopping program? Hi Steve, thank you for your question. 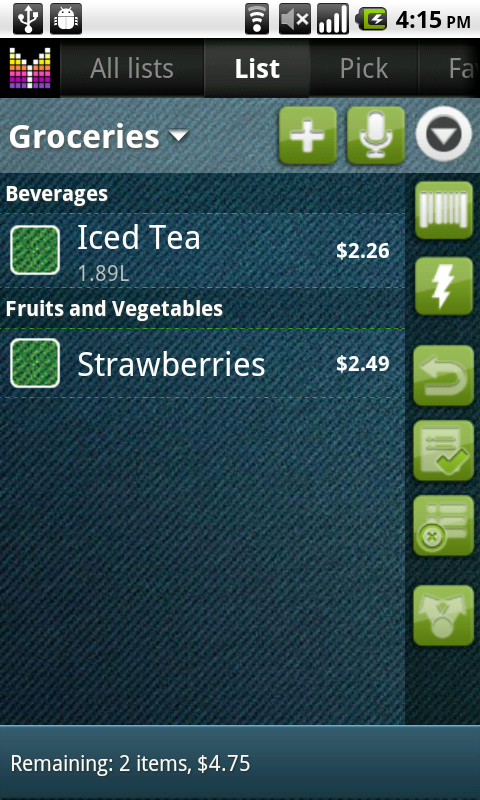 Unfortunately, at the moment only Barcode Scanner app is supported in Mighty Grocery. 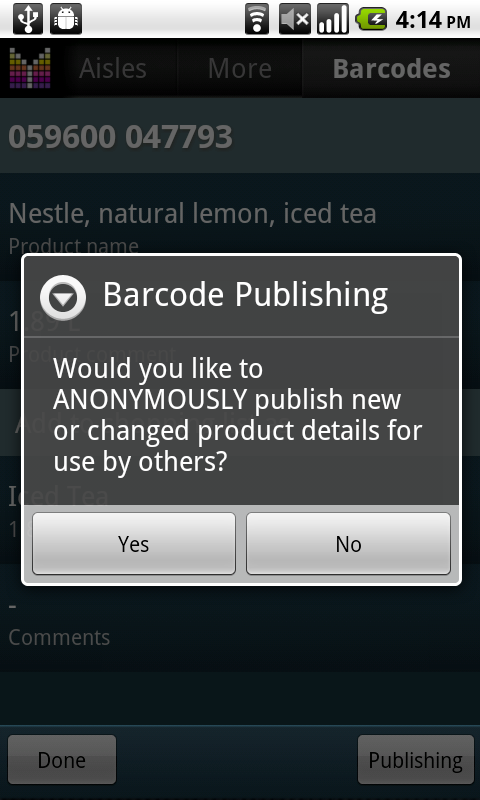 We are not aware of any other barcode scanning app which would allow third-party integration. I tried to scan for this question in the previous postings for this issue, so if this has already been dealt with, please excuse. For you see a while ago I received an injury that makes processing large amounts of printed information difficult. I tried but didn’t see this topic covered. What I want to be able to do is scan the barcode of my favorite pickles and 1.) Have it show up in my shopping list but also 2.) Be retained in my permanent list. I am successful with number 1, but unfortunately not with number 2. Any help would be ever so appreciated. Any flaming of this plea for help would hurt so. I am using a DroidX©, the latest version of your software, and just this morning loaded the version of the barcode scanner that the program linked me to. Your program was a godsend before the accident, it is ever more vital in my life now. Thank you ever so much. Hi Jimmy, thank you for your question. Kindly note that there are several options to permanently keep scanned items in the app. 1) Scan items under Favorites tab which will allow adding items to your shopping list with one-click going forward from Favorites page. 2) Scan items into Pick list which will allow adding items with one-click from Pick list page. To do so, just go to Menu –> Settings –> Pick list –> My Picks and then scan items as you would in a shopping list. Is there a way to move or copy barcode scans from the bar codes list to my pic list or favorites list. I have many items in my barcode scan list that got deleted from my favorites list that I want to put back. How can I do this. Thanks for a great application. Hi Greg, thank you for your question. Unfortunately, the only way to put your scanned barcodes back to favorites would be to re-scan products under Favorites page. The good news is if you made any changes to product names or added new barcodes, the app will use your records from Barcode Scans page. One more consideration — your items with assigned barcodes may exist on History and Pick list page if you ever went shopping and checked out the items. If this is true, it would be easier to add items with barcodes to Favorites from History or Pick list. I see that in November someone asked about this. If you have an item in your shopping list, that has a bar code associated with it and your shopping in the store, find the item and scan it, should it cross off the item instead of adding it to the list again. You told him it was a good idea. Is it going to be fixed to work that way? Sometimes the list is really long and you know you need the item, so rather than scroll to find it, just scanning it to check it off would help. Greg, thank you for your comment. To quickly answer your question, yes, we are going to fix this. However, some features are getting pushed down in our priority list because other features get more attention from your customers. Sorry for keeping you and other people waiting. After the final List Sync update we will have a chance to address smaller features like cross-off items rather adding them again after a barcode scan. Thank you and I look forward to hearing from you again. I just scanned a bunch of barcodes in under the “barcode” tab (which I added at the top of my screen). I haven’t been able to add these to any lists. When I “Search” to add a new item to the Groceries list, they don’t show up. How do I add something in “barcodes” to “Groceries,” etc? Downloaded this app about a week ago, and it’s so much fun. 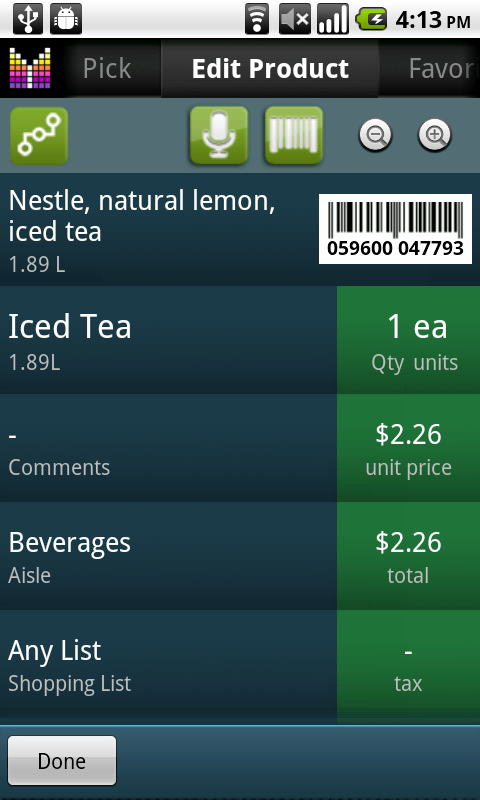 Have been to the grocery store (Publix) once since then, and used the app. FANTASTIC! I was able to get in/out in about 15 minutes less than it usually takes, due to the automatic sorting by aisle (my paper list is typically stream-of consciousness, and thus a bit inefficient), and it was WONDERFUL to know how much my bill was BEFORE the cashier hit the total button. Love the app, and have already recommended it to several friends. Hi Kelly, thank you so much for your feedback and comments. Unfortunately, yet there is no way to add items from barcode page into your shopping list unless you scan a barcode in a shopping list (barcode button on a side bar). The other way to assign a barcode to an item would be to open Edit Item screen for the item and scan barcode by clicking a button on the top. Kindly note once the barcode is assigned to a product, the barcode will get populated automatically as you add the item to a shopping list. Thanks again and please let me know if any further clarifications are required. I read through the guide and quickly through the posts, but I think it is possible for me to assign any of the existing barcodes to an item without rescanning the item. Hi Tom, thank you for your question. Unfortunately, there is no way to assign a barcode to an item without scanning it. However, once you scan a barcode and assign it to an item, it will be kept in product catalog for future use. Also, you may want to assign barcodes to products in Pick list directly so that barcodes get reused when item is added from a Pick list or via Add button in shopping list. I’ve sanned items but I can add them to my list. Fred, have you tried scanning in shopping list? Any details on steps to reproduce? Okay so I have to go to a specific list ie. Walmart, Kroger…before I scan. So I scanned a number of items now can I add them to a list or can I move an item say from Kroger, Walmart or barcodes scanned list. I will buy the same item at different stores. I want to be able to pick from this list when I create a new shopping list. Fred, thanks for your question. 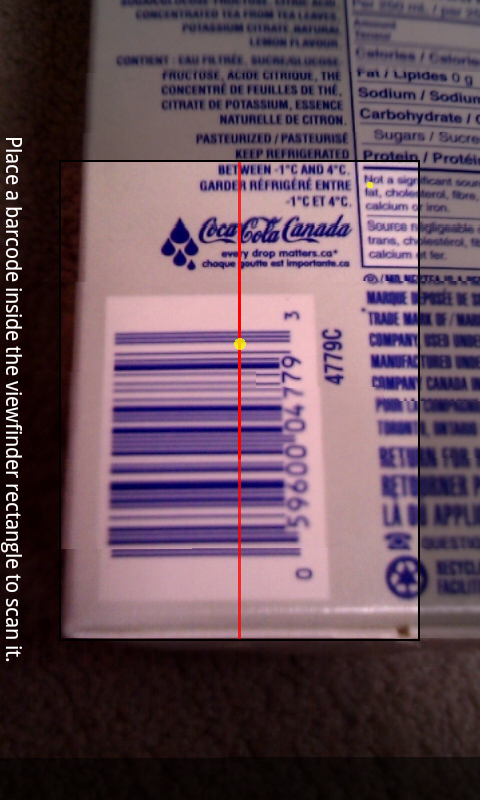 There are two options to save shopping items with scanned barcodes for future use. First, you can add items to favorites via scanning barcode, or your can assign barcodes to existing favorite items (see in the Guide above). 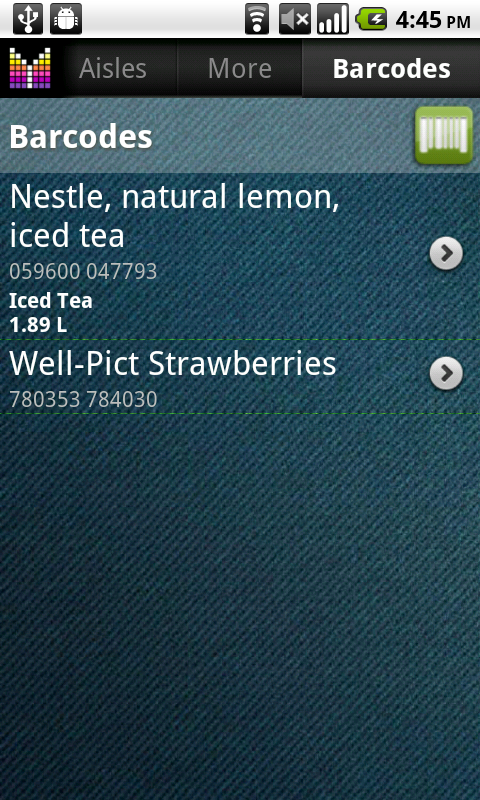 Second, you can add items with barcodes to Pick list. To do so, open Pick tab, click on a button which looks like gears and you will get to My Picks page. 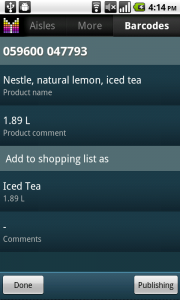 All items you add here (via barcode scan or assigning barcode to existing items) will be available for you to pick from as you create a new shopping list. When I edit an item that is already in my list, whether it is in the picks list or my favorites, and I scan a barcode, the barcode list opens showing the item is not found. This is OK, I understand this. But, if the item is not found, it would be nice if the information for the item that I already have in the list was copied over to the barcode list rather then having to enter the information all over again. So if scanning a barcode in for an item that is already in the list is supposed to assign that barcode to the item, this is not happening. And I think it should. 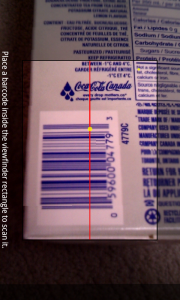 I also found that, having to enter in the information in again, and not getting the information entered exactly as it is for the existing item, the bar code does not get associated with the existing item, and subsequent scans will not bring up the item already in the list, it will bring up the item for which was entered for the barcode manually. Keep up the good work! This a fantastic app and it gets better all the time. Greg, thank you again for sharing details of your experience. I agree, thanks for the idea. I guess it may be because the barcode fields are left unpopulated. The app is pretty naive now thinking that you may have a certain barcode associated only with one item. 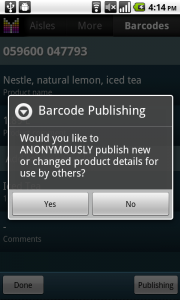 If a barcode is assigned to several items, the app will randomly pick one of the items. I believe, that better solution would be to ask user to choose one of the existing items, especially in the lights of our discussion of barcode groups. Hi Alex. Barcode scanning, when you scan an item it adds that item to your list, but when in list mode I thought if you scan the item while at the store it would cross it off and add it to your cart, but it don’t, it just adds the same item to the list again, is it possible for you to change this? Nothing you can do about this, but if using barcodes and say for example you have fruit juice in your favorites then you would have to list every flavour, as each flavour has it’s own barcode, with lots of products like this you will soon end up with a massive list. Would be nice to hear other users opinions on this. Thank you for the suggestion. It’s a good idea to cross item off if its barcode is scanned again in shopping list. As to different varieties of a product, I guess we can consider adding multiple barcodes for a single item. However, on Edit Item Details screen only one of barcodes will be shown. Please let me know if this would be helpful. Multiple barcodes for a single item, yes that sounds like a good idea, if it will work. When you say multiple codes per item, how many codes per item do you think would be possible? John, I guess we won’t put any specific limits on number of barcodes assigned to an item. Only memory limits and common sense will be in place. As to barcode scanner app, at the moment we support ZXing Team’s scanner only. I hope they will improve recognition quality over time. I don’t see how this would work. Bar codes are unique to each product and variety of that product. If you assigned your own bar code to a product by category, where would the bar code be located? Where would you scan it from? Would you carry a hard copy with bar codes for general categories of products? You would also have to generate a unique bar code, that is based on something like your name. This is because UPC bar codes are made up of a number assigned to a manufacturer, and a number for the individual product. For example the first 5 digits of the UPC code for Campbell’s is assigned the code 51000, Heinz is 13000 and Green Giant is 20000. The second set of 5 numbers is a unique number the manufacturer assigns to one of their products. It is conceivable to find the same last 5 digits on more than one product, but because the first 5 digits are unique to the manufacturer the sets of numbers together make it unique to that specific product. Maybe the app could offer the ability to group items together. Using your example, you could add the different flavors of Welches juice to a group called Welches Juice. And then when you scan a specific flavor of Welches Juice you would be given the option to add to your list as the group name rather than the individual item. When adding new items to the barcode list there should be an option to group the new item when more than one product by the same manufacturer exists. That way, if the manufacturer has more than one type of product you can group as desired, at the time the time is scanned. Greg, thank you for your considerations. Grouping barcodes is another possible solution, though it may be difficult to create simple and intuitive UI to administer them. In the solution we consider, a shopping list item is an “umbrella” or “group name” for a set of barcodes. In the simplest case, which is available now, a group will consist of just one barcode. Using your example to describe how we envision this solution, imagine there is a “Welches Juice” item on Pick list and 5 barcodes assigned to that item. If any of the assigned barcodes is scanned in a shopping list, the grouping “Welches Juice” item will be added to the shopping list. However, if a barcode is scanned on Edit Item Details screen for a new item, only this specific barcode will be assigned to the item. Hopefully, this makes sense. Please let me know if you have any comments in this regard. This sounds good. Less complicated to the more average user. Me?, I’m a techie so I intend to overthink things sometimes.